Drag-and-drop, hundreds of stunning templates, tons of powerful apps, mobile editor, secure hosting! That sounds great and enticing, but what do all of these elements look like when published? Users who are uncertain about choosing Wix to create their sites are often interested in seeing some real sites designed with this site builder before making their decisions, so today we take a look at different Wix-powered websites – from portfolios to companies, communities and stores. Chasedekker.com is a website of Chase Dekker, who calls himself a “wildlife and conservationist” photographer. Chase is a real nature enthusiast, who tries his best effort to reveal the beauty of the surrounding world in his pics. Just have a look at the best works of the photographer in the interactive home page slideshow to understand that he has a real calling for his occupation. When browsing the website, you can view the gallery of the best works of the author, sign up for his workshops, see new releases, shop for the most impressive digital downloads, custom prints, posters and even a calendar with his best nature pics! It’s also possible to check out Chase’s Instagram feed. Wish to stay informed about the latest events and updates? Then sign up for the newsletter to be aware of everything Chase Dekker would like his fans to know! 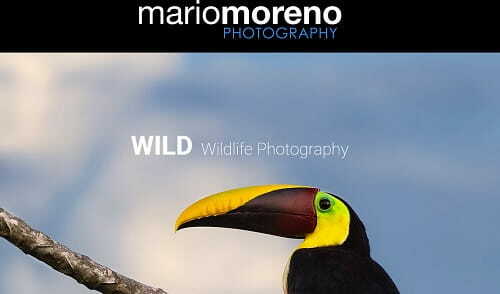 Mariomorenophotography.com is an amazingly beautiful and attention-grabbing website created with Wix. The website belongs to Mario Moreno – a photographer, who is proficient in a variety of photographic genres and can travel the world to complete the orders. The professionalism and talent of the photographer are vividly manifested in his bright and vibrant photos represented in the full-screen slider at the home page. This is also the place, where you can find out the contacts of the photographer, his social network accounts and online form to get in touch with him. The menu is hidden in the top right corner of the website, giving access to Mario’s collection of works, client testimonials, Buy Prints section and workshops info. This is a decent and informative sample of a Wix-powered website! 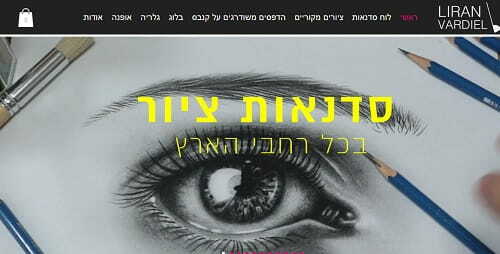 Liran-vardiel.com is a website of Liran Vardiel, a talented artist, who creates stunning paintings on various topics. The amazing artworks of the author are presented in the home page slideshow to draw user attention from the very first sight. There are also personal photos of the artist from his exhibitions and videos of the creative process. You can subscribe to Liran’s Instagram feed to be aware of his updates and upcoming art shows. The photos are presented against the black-and-white background image of the photographer to create a unified impression. It’s possible to subscribe to the website newsletter to stay informed of the recent news and events without the need to visit the website over and over again. 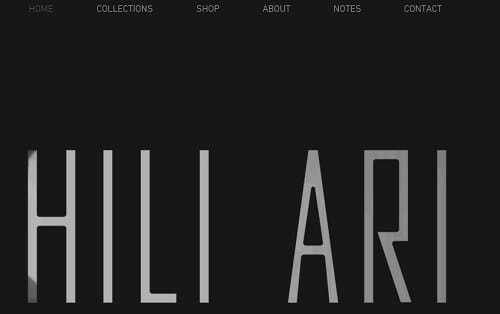 HiliAri.com was featured in the Wix of the Day section, so I decided to start off with this mix of portfolio and e-shop. This website is a very elegant and simple designers’ website. With a basic structure of pages and a beautiful layout for visuals, it’s a perfect website for fashion designers. This site’s design can show us how the dramatic splash screen and beautifully minimalist design will convey your vision without overwhelming the viewer with lots of information. 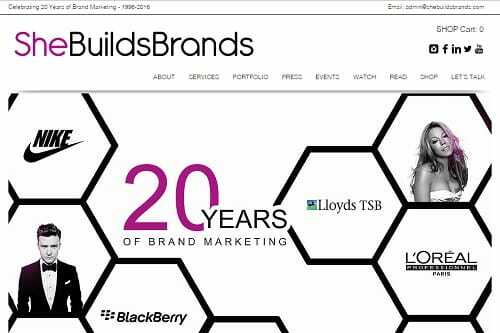 SheBuildsBrands.com is a well-organized website that’s chock full of social proof and customer-centric content. There are links to YouTube, Instagram, Facebook, LinkedIn, Pinterest, Twitter and even SoundCloud! Kubi Springer, the owner of the website has an impressive list of brands in her resumé, including Nike, Blackberry, L’Oreal Professionnel, Mercedes-Benz Fashion Week and MOBO Awards, among others. There’s a lot to explore on She Builds Brands’ website – the author offers lots of detailed info about what her Team do. There’s a frequently updated blog, a newsletter sign-up form, lots of videos, and even a shop. Through the website, visitors can purchase audio mp3s, books and video DVDs that will assist them to build their brand. The website is beautifully designed, but what really stands out to us is the focus on the customer and valuable content. Congratulations to Kubi on an attractive, effective website! White space is the keyword here. 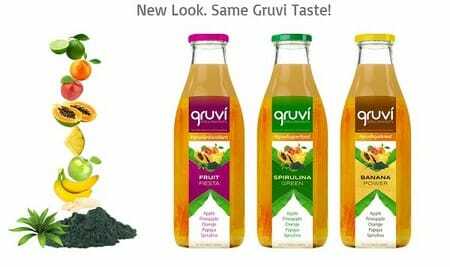 GruviJuices.com creates a truly unique vibe. The product positioning creates a well organized layout for the homepage. What’s especially interesting here is that the product display appears in a natural, non-pushy way. The website shows us the smart use of white space leads a reader from one element to another. It also gives emphasis to the content area. The first screen clearly gives us an understanding of what can we find here. 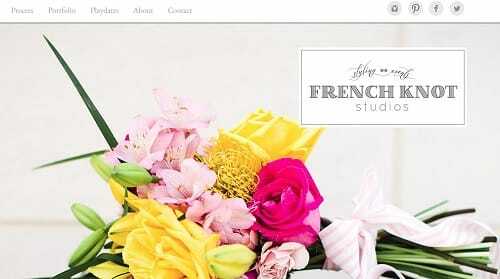 Frenchknotstudios.com is a nice sample of how a well-structured and functional website should look like. The site belongs to the event planning and photo styling studio located in Savannah, Georgia. From the very first look at the website, it impresses users with its design. The site was created in a soothing, inspiring and cheerful atmosphere and this is what attracts the attention of users, encouraging them to keep exploring the resource. Smart use of sliders and portfolio images that stand out from the crowd due to their high quality, gives the design of the site romantic and touching look. Apart from the outstanding design, the site also features functionality, which is manifested in the availability of social media buttons, online contact forms and detailed information that is always at hand. CelebrateeShop.com is an excellent example of a Wix webstore. The well-branded, professional-looking website succeeds in three key areas that are very important for any shop: visual representation, user engagement and user experience. There’s a perfectly sized logotype and a homepage slider, and even some products down the page on the welcome page. But despite the volume of visual content, tasteful color choices, easy navigation and good layout keep it from feeling cluttered. What is the most beautiful and catchy from this site – it’s scroller photos – they’re extremely alive! It seems that all those people are here with you. It’s a smart marketing decision calling to make an action. SianSummerHayes.com is a website of the freelance illustrator and artist. 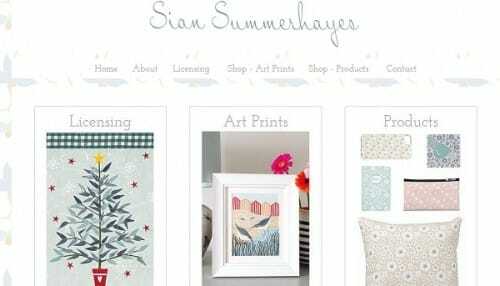 I’m really impressed with how Sian has used Wix to organize, highlight and promote her artworks. The website itself has no shopping cart, but it contains links to the author’s shops on Etsy and Zazzle. First look at this website gives us an understanding that it’s author is creative person. But I don’t really know why Sian shows a direct link to the Whistlefish and hides in ‘Shop’ menu her Etsy page. 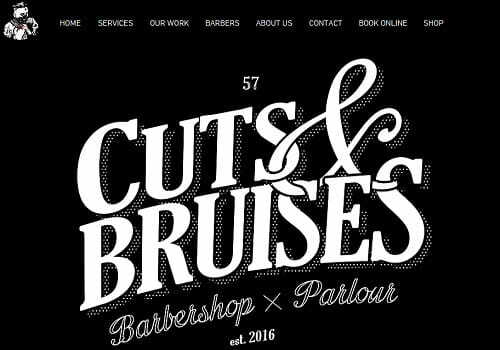 With is genuinely manish style design, CutsAndBruisesBarbershop.com proves to be a perfect example of a barbershop. Featuring the Wild West motives, a strong catchy name and contrasting black-and-white colour scheme, the website cannot but attracts the attention of users from the very first glance. There is no need to browse the website looking for the required info here, although, this option is available at the website as well. The About Us info, the Contacts with a convenient Google Map app and even the YouTube video contribute to the ease of perception and provide maximum info about the barbershop a user might be interested in. What’s important, the list of services and their cost is provided at the homepage as well. This is a decisive factor for many customers choosing between several barbershops. The online booking option as well as the drop down menu allowing to choose the preferred barber are also available at the website to make customers sure that they will be provided with the required services on time. High quality design. We are all visual by nature, so the first thing we notice is imagery and the overall look and feel of a website. Work for a Credit Union has a modern look with it ghost buttons, lots of whitespace and high quality photos. Plenty of information. It’s an art to present plenty of information in an organized and easy-to-navigate fashion, and this website succeeds in doing that. There’s an extensive About Us page, plenty of info on credit unions, and what’s more important – contact information. There’s a Google Maps embed with the physical address of the company, telephone number and a feedback form. Updated information. This is one of the common things site owners overlook. From your website’s copyright date in the footer to your blog, your website should look updated. The owners of the Work for a Credit Union website know this rule and regularly update their blog. 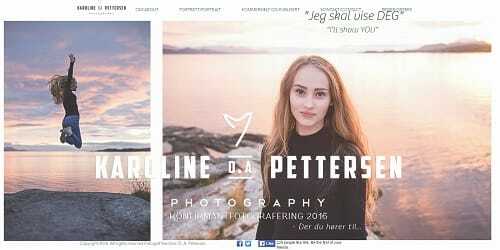 Karolineoapettersen.com is also a visual-centered website. It’s simple, clean and inspiring. Karoline uses a high-res, full screen background image that immediately captivates the viewers. The overall minimal style helps focus the attention on the author’s photographs that the site is promoting. But be careful – HD photos and videos, embedded on your website, could slow down website loading. Not every user can wait a long. And one more note – the menu fonts should be more bold or contrast – when first image scrolls on them, it’s almost impossible to read menu properly. FlexRnD.com does a great job of telling potential customers what they do differently from others and how that would benefit their clients. Throughout the website they showcase samples of their work to support their claims. 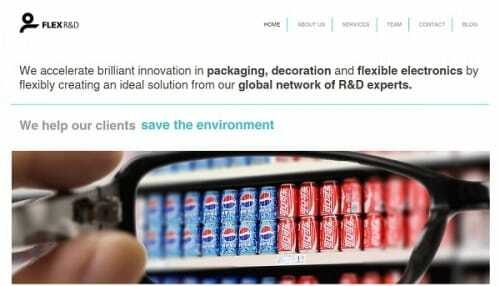 What’s great about Flex R&D’s site is that they manage to provide visitors with plenty of information while still maintaining a well-organized, user-friendly website. They do it by taking full advantage of the features available to them through the Wix HTML5 sitebuilder. Some of these include a blog, a homepage slider, video embeds and more. Another trouble with the menu of this website – it’s submenu covers main text when opened. And the blog should be updated more frequently but not once a year. InheritingTheNations.com is a Christian school with religious orientation that provides deep knowledge of Bible among its followers. 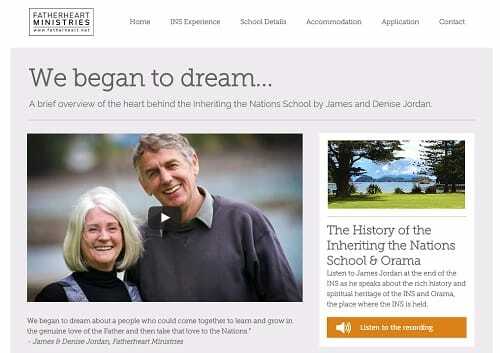 It teaches main principles of religion, theology, and the events and doings of that Nations School is presented with about a several dozens of awesome images and videos in the INS Experience page of their website. It’s an example of classic website building – with homepage, contacts and some information between those two pages. A perfect decision fo organisation – everything is clear. 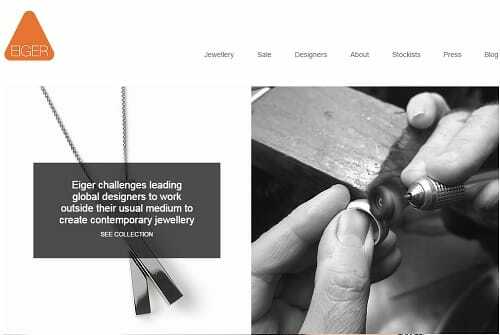 EigerGallery.com is an online shop that unites jewelry masters from different fields like interior, furniture and sculpting and graphics, to research unique custom elements. The numerous design ideas of these masters make for an exiting variety in the pieces of jewelry presented on the website, powered by Wix. The flat white background looks as an ideal layout to point and mention on unique pieces. If it wasn’t annoying pop-up message, that appears after few seconds of website loading, I give this project the first place. But it seems to be not today. Luckily for us, Wix displays sites published by their users on the official webpage, so you can easily find more samples. There’s also ‘Designers Showcase’ block showing some of the most successful projects made by professionals. By the way, if you’re an owner of a website created with this particular site builder, you can also submit your creation to be able to expose it to the audience of millions. Wix user? Submit your website to get featured on SuperbWebsiteBuilders!